Jed Wallace surveyed Pompey’s season and admitted: We have failed. A haul of four points from the past two matches have the Blues limbering up for potentially a sprint finish to the campaign. But Andy Awford’s side remain in 14th spot with five matches left to reflect a disappointing season. The play-off challenge pinpointed by chairman Iain McInnes back in August has never emerged. Meanwhile, Pompey have never truly been threatened by the relegation battle raging below as they look set to end up in mid-table. Wallace shares the fans’ unhappiness at how a campaign initially brimming with optimism has descended into the mundane. And as Awford’s men prepare to take on Morecambe tomorrow, the midfielder believes the side should be placed higher up the League Two table. Wallace said: ‘When you are this far into the season the table doesn’t lie – we have failed. ‘Chelsea are better than Aston Villa, the table is spot on, and we are where we are for a reason. ‘Everyone who comes into the training ground every day knows it has not been good enough. ‘People have to look at themselves, myself included, every single one of us. We have failed, it’s as simple as that. ‘There are vast reasons for it. If I could put my finger on it I would probably go to Mark Catlin and ask to be manager and we would romp the league. ‘I’m a 21-year-old player and I am sure the manager can go into it better than me. ‘But it has always been the same since I have been at Portsmouth. A very, very good group of players but not particularly a very good team. 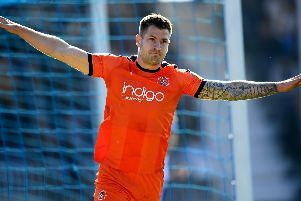 ‘When you look at Wycombe – and I am being completely honest – how many of them would get into our best XI? ‘That sounds ridiculous to say but if you ask most managers in the league there are probably not that many. ‘It isn’t about being good players, though, it’s about being a good team and they have done that and are going to go up this season. ‘We played them at Fratton Park in September and drew 1-1, you would never have said they were going to go up. The manager has done an unbelievable job there. ‘Marcus Bean has gone there, yet would he play ahead of what we have now? ‘Would he have played if Wes Fogden, James Dunne, Danny Hollands and Nigel Atangana were all fit? ‘Probably not. However he has been playing every game for Wycombe and fair play to him, they are going to go up. Pompey head to the Globe Arena tomorrow looking to push on from their recent improved form. Meanwhile, others are fighting it out for promotion. He added: ‘Look at the table, Burton have the best players and Shrewsbury the second best, that’s the way football is. ‘It’s about collectively as an 11, 18 and 25-man squad doing as well as you can.